One of the best things about Xining is that it’s so close to the countryside. Get out of the city (it’s as simple as getting off the valley floor) and you’ll find yourself in beautiful, rolling fields of barley and rapeseed dotted with small villages of mud houses, the entire tableau backed by towering, snow-flecked mountains. Nearby attractions include the famous Kumbum Monastery (Ta’er Si) in Huangzhong 湟中, Gonlung Monastery (Youning Si) in Huzhu 互助，Shachung monastery in Hualong 化隆, and Huzhu Beishan National Forest Park 互助北山国家森林公园. The countryside around Xining holds some great hiking. A lazy-feeling but surprisingly productive way to discover new hiking spots is to take a local bus to a random nearby location (sometimes after google maps satellite scoping) and go on a dayhike up a nearby valley or mountain. Some of my favorite locations (outside the areas below) are in the Laji Shan 拉脊山 mountains, especially the area off the old road to Guide over the Laji Shan pass, the Liutaigou 六台沟 area off the Ping’a 平阿 expressway (south of Ping’an), and the small valleys south and southwest of the Kumbum. The mountains above Xining itself are also laced with trails and roads; see the “running in Xining” section for details. Finally, there’s good hiking in Datong 大同 county, from the Laoye Shan 老爷山 ridge right above town to the national forest parks (Chahanhe, etc.) outside of town. The famous Kumbum monastery, an important site for the Gelukpa order of Tibetan Buddhism and a major pilgrimage center, has over the past twenty-odd years been developed as a major attraction for Chinese tourists. As a result, the sacred site – revered as the birthplace of Tsongkhapa, the Gelukpa founder – is in some ways a museumlike idealization of its former self. Clicking cameras are jabbed in monks faces, crowds of culturally insensitive visitors clamber over relics, and the megaphone-amplified patter of tour guides reciting endless statistics disturbs the calm of the beautifully constructed halls (if you want to see less tourists, don’t go during the summer high season).. But despite the tour groups and generally carnavalesque (rather than religious) atmosphere, the Kumbum is still a major religious center for Tibetans from all over the plateau – and, as such, retains a layer of importance and authenticity which overlays all of the excess touristic shlock. In other words, it’s still worth going to see this monastery, an undeniably important site in the history of Tibetan Buddhism. Outside the monastery walls, you can spend many hours (or days) hiking down narrow roads and trails winding into the fieldcheckered hills below the Laji Shan mountains. For starters, walk up the roads leading uphill behind the complex, or follow any trail leading uphill out of the town center. Though it’s easy to get lost, it’s also easy to get found: head towards any major valley, and it’s easy to catch a bus (or hitch) back to Huangzhong or Xining. To get to the Kumbum (Huangzhong) from Xining, take a public bus (1-3 kuai) from outside the Xinning Lu bus station or from Nanchuan Donglu just south of the Kumbum bridge. These local buses will stop frequently and can take nearly an hour to reach Huangzhong. You can also catch an express bus from any of Xining’s bus stations. Ethnically schizophrenic Hualong is a little-visited though interesting and multifaceted area to explore. The Hui Muslim-dominated valleys are filled with fields of barley and wheat; ari slopes dominate the lower valleys, minarets punch through the cluster of trees surrounding each village, and a nastily incomprehensible dialect of Chinese is the language of choice. Head uphill, though, and you’ll enter the comparatively lush greenery (assuming it’s summer) of the predominantly Tibetan mountain regions. Here, steeply terraced fields of barley and potatoes spread out high above the valleys below; lightly forested mountains serve as pasturage for sheep and yaks. The county town is currently (2013) in the process of being moved from Bayan (巴燕) to a new, purpose-built site on the Yellow River near Qunke (群科) – over forty kilometers away. Why? I wouldn’t even begin to ask. Hualong is also famous for its Muslim cuisine; while this fame is limited to various types of noodles, barbeque, and shouzhua (手抓, also called baitiao 白条, e.g. big hunks of boiled mutton), this admittedly narrow range of food is done quite well. The most famous site in the county is the Shachung Monastery, where the important reformer Tsongkhapa was ordained as a monk. South of Ping’an and across the Laji Shan mountains lies this important monastery where Tsongkhapa was first ordained. Sitting atop a massive sandstone cliff overlooking the Yellow River valley, the monastery commands impressive views. The large complex includes a number of temples, a small forest, and a kora path. There is one tourist bus from the main bus station in Xining; otherwise, you will need to hire a car. This monastery, located in an amazingly quiet, forested mountain valley north of Ping’an, was once the most important in the entire Huang Shui river drainage, with nearly 7,000 affiliated monks in the Huzhu area! Today, this number has dwindled to only 200-300 monks, but the monastery’s chapels still climb intriguingly up a forested cliffy hillside above a small town. Hike a couple of kilometers upvalley to find an intriguing ‘treehouse’ monastery perched above the valley floor. This entire area is also excellent for hiking, with longer trips to Huzhu Beishan (see below) possible for the adventurous. To get here, take the “direct” (1.5 hour stop in Ping’an) bus from the main Xining bus station at 10:45, or go to Ping’an and try to find a car. There are a couple of places you can stay in the village; ask around. This spectacular area of high snowy peaks, forested canyons, silvery waterfalls and swiftflowing clear streams lies about three hours northeast of Xining. This is a place locals go on vacation, and consequently is pretty uncrowded – even during major holiday periods. The hiking (and probably the biking) are excellent throughout the region. The park is entered via a side road above the town of Beishan or Jiading 加定, located on the Datong river – itself the Qinghai-Gansu border. You will pass through the park entrance gate, where you must pay an admission fee, before you can follow the road upstream into the park. A few miles up, the road forks; the left fork goes into an enclosure of high mountains, while the right continues up a few miles before splitting again. This time, the left fork goes uphill towards the trail to Tian Chi 天池 (Heaven Pool), while the right fork leads to more waterfalls and a dirt road which turns into an easily followable yak trail leading over the mountains to a valley between Huzhu town and Youning Si (2 days; after descending out of the mountains, walk along the main road until you can flag a ride to Huzhu county town). The best way to explore the hiking options available, however, is to randomly explore the beautiful valleys and mountains and yakfilled meadows that make up this wilderness reserve. There are several hostels in the park valleys, easily visible from the main roads, and camping is possible just about anywhere. To access the park, hire a car from Xining or jump on one of the buses from Xining or Huzhu. But be forewarned: sometimes, the buses inexplicably don’t run. And pretty much everything shuts down in winter, when the area gets a bit more snow than most other regions of Qinghai. The homeland of the Salar people, descendants of a group of central Asian Turkic-speakers forced into this area in the wake of Mongol incursions, Xunhua is unusually diverse both in its landscapes and its populace. 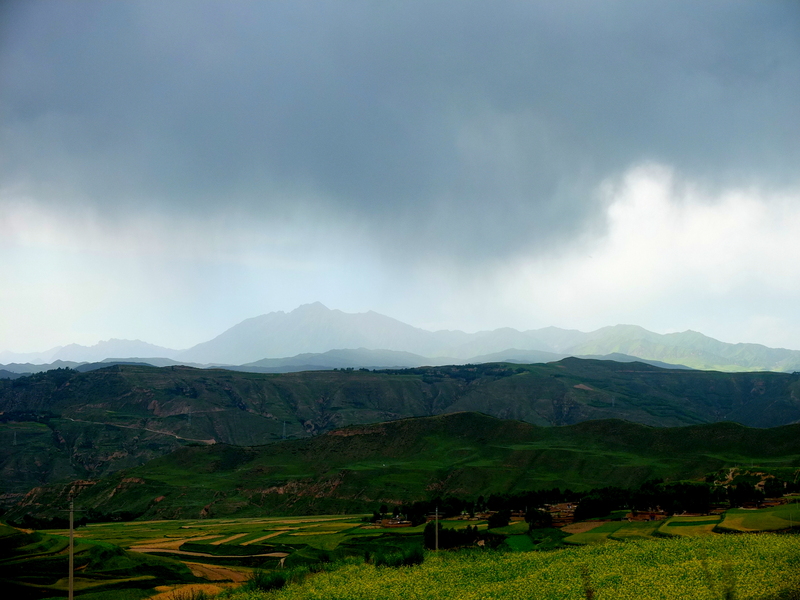 Ecologically, the land reaches from high grasslands on the border of Gansu province through rich forests and areas of terraced farmlands down into the arid redrock Yellow River gorge – the only area of Qinghai below 2000 meters. Its population, a mixture of Salar, Hui, Tibetan, Han, Dongxiang, Bao’an and other groups, is similarly diverse. The county’s prime attraction is the Mengda Nature Reserve 孟达自然保护区, the centerpiece of which is Mengda Heavenly Lake (孟达天池) and its surrounding forests. The heavily Tibetan areas around Dowi (多围) and especially Wimdo (Ch: Wendu 文都) – with its large monastery and sites associated with the 10th Big P – are also well worth a visit. Unfortunately, despite living extremely close to this region I have not spent much time here; as such, I will simply shut up and let your (potentially) more-informed guidebook do the talking. Hey Kate, I’ve heard rumors of a small road being built up to the lake – worth checking in about. I do know that the main valley up through (and out of) the park is still pretty wild. In the park there are guest houses, but outside there is nothing – might be worth borrowing/renting camping gear from Tibetan Connections upstairs from the Lete Hostel. Also, you’ll likely need to hire your own transport to go to this area. Feel free to email with more questions. Hi, we are from Belgium and want to go to Rebkong (Tongren) for the Shaman festival and to Yushu for the Horse race festival 25th of July. Do you know something about the date and the villages where the ceremony is ? These festivals are on the lunar calendar, and so they fluctuate from year to year. Check with travel agencies in Xining (such as Tibetan Connections) to find out this year’s dates. As for villages, the festivals around Rebgong are in pretty much every village in the valley. Many people go to Gomar, Sengeshong, Satchi, Jang’gya, Togya, or others. Thanks for the good information, I want to go to huzhu beishan park the day after tomorrow, I have camping gear with me. Do you kniw if and where I can get a map of the park ? No maps available, except the not-to-scale roadmap at the entrance station. Good luck!